A school employee was almost paid £1.5m in wages after an error by the firm responsible for council payroll services, it has been revealed. Sue Gordon, business manager at Lincoln's Monks Abbey Primary School, said someone would have been "down for a bit of a bonus" if she had not spotted the blunder. 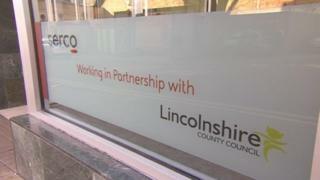 Serco won a £70m contract in April 2015 to take over HR and finance support for Lincolnshire County Council. The firm blamed human error. Ms Gordon said she noticed the mistake while checking wages earlier this month, and managed to get it changed in time. "At this time of year we don't have that kind of money left in the school budget," she said. She said Serco was making payroll mistakes on a regular basis, and most were down to "miscommunication, or people punching the wrong figures in". From April, Monks Abbey Primary School said it would be moving to a new provider because of a number of problems with Serco. Abi Tierney, delivery director for Serco, said there had been some "issues" with parts of the service, but that things were improving. She said improvements to the firm's computer system had been implemented, making it harder for mistakes to be made. However, she added: "It's going to take time for us to rebuild confidence." Errors have led to wages being unpaid, school phone lines being cut and, in one case, sanitary facilities repossessed. In May, Serco was fined more than £1m after failing to pay bills to suppliers and leaving staff without wages. The firm, which provides a wide range of public services, hit the headlines in 2013 when it, along with G4S, lost tagging contracts following allegations they charged the government for tagging people who were either dead or in jail.